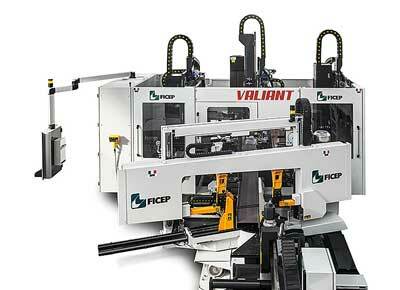 The new Ficep Valiant CNC drilling line is said to offer over double the number of tool changer positions than its predecessor – Endeavour – while a 300mm extended auxiliary axis increases the window of operation for scribing, milling and sequential drilling. The addition of 14 new tool changer positions on each of the machine’s three spindles takes the total tool availability to 42, while the spindles themselves have been redesigned to be all the same, allowing for a reduction in inventory for spare part replacement. This is said to offer steelwork contractors productivity gains and simplified maintenance. Mark Jones, MD of Ficep UK said: “We’re a company known for our commitment to R&D, devoting 5% of our annual profits into developing steel fabrication machines that work effectively for the modern steelwork contractor and Valiant is a perfect example of what this research can achieve.